A push of a button and luxury while showering is redefined. 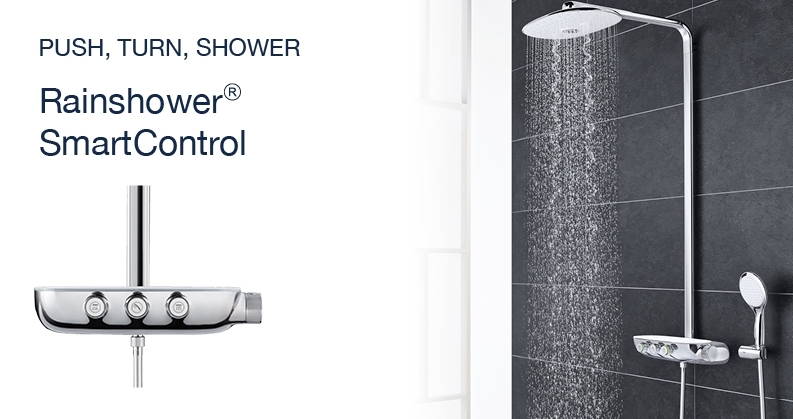 With Grohe SmartControl, showering becomes a never known intuitive experience. You're always just one handle away from relaxation and enjoy your perfect feel-good shower by pressing & turning. A smart innovation that impresses with its unique combination of state-of-the-art technology and feel-good function. In a world that is getting smarter, you can keep the control of your well-being with the help of Grohe SmartControl. And this only with just the push of a button. So, you can choose the spray mode that is only one for you: perfect. No matter if you want to experience the unique relaxing rain feeling or the TrioMassage jet. Or you can take everything into your own hands - with the Power & Soul hand shower. But you do not have to settle for just one jet. Grohe SmartControl also makes it possible to combine different blasting functions with different amounts of water. The innovative system consists of several buttons. Instead of laboriously adjusting your standard faucet (especially if calcifications are created), all you have to do is to press the button of your desired spray mode. Now you can adjust the amount of water perfectly with just one turn. The trick: the Grohe SmartControl system saves your settings, so you can easily switch between the spray modes or interrupt your shower without having to reset your preferred amount of water each time. This is how the best becomes everyday life and you can immediately experience your individual showering comfort at any time. Another innovative highlight of the shower system is the temperature control via the Grohe TurboStat technology. With the TurboStat thermostat you handle control your well-being temperature precisely. Whether a cold and refreshing shower in the summer or to warm up relaxed in winter, the extremely sensitive thermocouple ensures within fractions of a second the perfect temperature and keeps it absolutely constant while taking your shower. Depending on whether you want to completely redesign your bathroom or renovate an existing one, there are different solutions that affect the installation. One differentiates between surface-mounted, flush-mounted and surface-flush-mounted versions. If you opt for the surface-mounted version of Grohe SmartControl, you can choose between two variants. On the one hand the surface-mounted version DUO, where you have everything under control with three buttons. You can choose the buttons so that you use one button for the hand shower, while the other two buttons control the overhead shower. The MONO version has two buttons that make it easy to control the head and hand shower and invite you to a wonderful showering experience that you'll never forget. The advantage of both versions is the integrated place to keep shampoo and other bathroom utensils. You can choose between the colors Moon White and Chrome. The classic chrome gives your shower a pleasant ambience and looks radiantly noble. With Moon White you put a special highlight of acrylic glass into your shower. If everything should take place behind the scenes, then you have just the right alternative with the flush-mounted version. Especially if you are planning a new shower and want to have as much space in the shower as possible, this variant is the best solution for you. It does not matter if you prefer the round or the angular design. Both design variations offer you an entire range of advantages. With a smooth and flat surface (43 mm protrudes the fitting only out of the wall) cleaning is no longer a problem. You have more space in your shower and can comfortably and intuitively set the temperature, spray type and amount of water. The flush-mounted version is available in the colors chrome and moon white. Minimalist look meets a breathtaking technical variety. Which means for you, to let work behind the scenes and enjoy the magic of water in front of the scenes in your shower. The combination solution also offers a large number of advantages. The water pipe is hidden behind the wall, the thermostat in front of the wall. The missing shower rod brings a significant cleaning advantage, is also visually appealing and leaves more space in the shower. 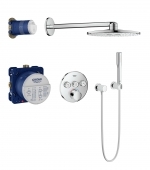 The thermostat is connected to the hand shower with a hose, the overhead shower has an invisible connection to the thermostat. This results in a great deal of flexibility, since the thermostat can be mounted individually, such as deviating from the central axis or even on the side wall. The combination solution can also be combined well with a bath spout and a hand shower and used for showering in the tub. The duo and mono models are available to choose, and the thermostat also has the convenient built-in shelf for shampoo. The colors chrome and white / chrome provide further customization options. The XXL overhead shower is the perfect complement to the SmartControl system and leaves nothing to be desired. With a length of 360 mm, it not only plunges your head into soothing water, but also plays around your entire body with the relaxing wetness. Just press a button and the tropical rain shower which come out of the round oval turns into a relaxing massage. You can choose between the Grohe Rain jet or the new and innovative TrioMassage. The TrioMassage massages your head and shoulders at the same time and gives you the maximum relaxation effect. You want to experience everything at the same time? No problem, just press both buttons and enjoy a relaxing massage under a rain shower. Not only the showering is easy and relaxing, but also the cleaning and hygienic aspect play an important role. With Grohe EasyClean, the metal base of the shower head can be removed and easily cleaned in the dishwasher. So lime and other dirt have no chance. With the two selectable colors chrome and white / chrome there is certainly the right thing for every taste and every bathroom decor. WHAT IS YOUR PERFECT SMARTCONTROL VARIANT? Would you like to know which SmartControl solution is the right for your bathroom? Grohe has a configurator that you can use to find it out. Get a list with all the required products as well as information about additionally required concealed units and other accessories.